Glen Grant was founded by brothers John and James Grant (in 1840), who had learned the ropes of distilling at Aberlour where they worked for 8 years. They became local legends for their social, environmental and political involvement, throwing grand parties, bringing the railway to Rothes and creating and maintaining a gorgeous botanic garden which is very worth a visit even if you don't intend to step inside the still rooms. Italy is the number one market for Glen Grant, especially YOUNG (5 yo) Glen Grant, and this has been the case since owner/manager began dealings with whisky pilgrim Armondo Giovinetti in the 1960s. Today Glen Grant is a top five whisky in terms of both sales and by-volume production, as well as continuing to be huge across the boot of Europe. Many would agree that although the Italians may love their Glen Grant young, it is a spirit that is at its best when it is of some age. Check out Serge Valentin's journey through the flavours of Glen Grant HERE. For all Single Malts of Scotland bottlings had on the mission click HERE. Tasted with RM who is in town visiting us. Very rich and elegant without any of the negative, overly-sherried effects. Fresh sweet fruit, some zest like hops, honeyed and sweet. Very mellow. Sherry and oak in a honeyed glaze," hay, dried herbs and vanilla stick things". Fresh fruit on the nose has turned dried, prunes, raisins, and a pleasantly bitter edge with tobacco and coffee. Sherried finish with a citrus peel tinge. A very gulpable sherried beast, not one for slow sipping by the fire, more for after dinner decadent, indulgent quaffing. Ran thought it was stronger than I did so to each their own. Amazing price for the age, sherry, and strength. One expects nothing less from Single Malts of Scotland. 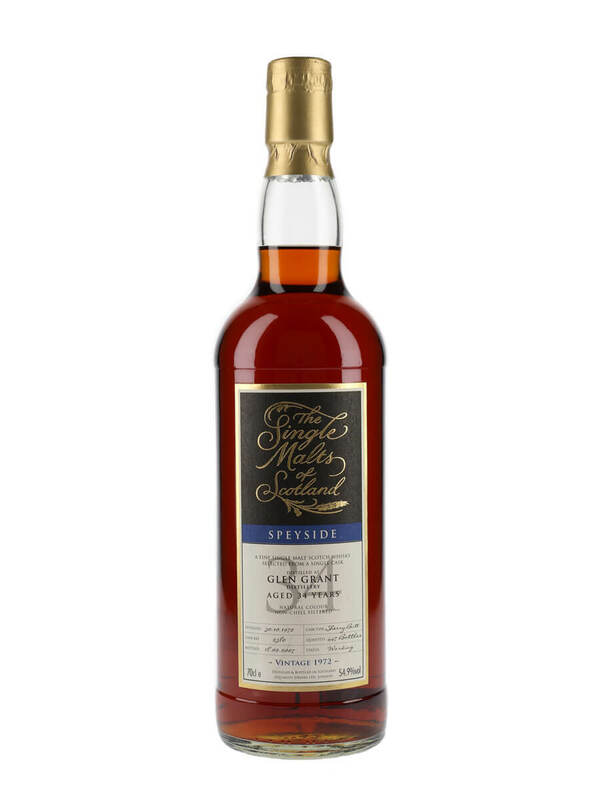 Malt Maniacs awarded this bottle with a Gold Medal in their 2007 awards and one can understand why.